The New Satcon Ecosystem Building on the industry's most field-proven technology foundation that has been tested in the world's largest and most complex solar installations, Satcon's solution oriented approach provides customers with the industry's most comprehensive pre and post sales support programs. CEC GreatWall, a subsidiary of China Electronics Corporation (CEC), has been Satcon'smanufacturing partner since 2009 and completed the acquisition of Satcon's intellectual property and assets in 2013. During this time, CEC GreatWall has manufactured over 3 GW of Satcon solutions, including over 100 MW delivered since the 2013 acquisition. 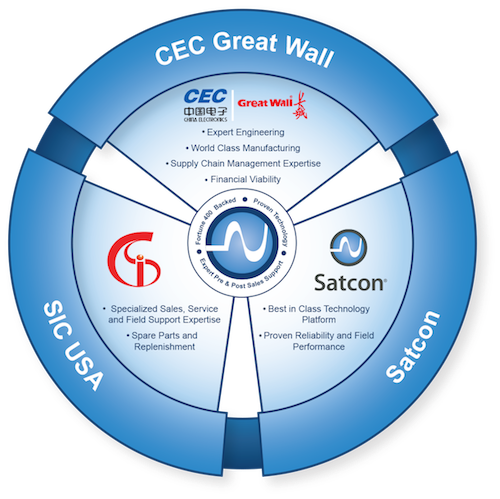 The strategic addition of Satcon to Great Wall Energy, a subsidiary of CEC, allows for continuous solution innovation, consistent high quality and reliability, and competitive costs that will allow Satcon to deliver the industry's lowest LCOE and ensure a strong partnership into the future. The new Satcon, along with its North American sales and service partner SIC USA, provides world class support, from system design through to intelligent O&M programs, to ensure that each system performs at its highest levels of performance over its entire 20+ year lifespan, all with Fortune 400 financial backing. Established in 1985, GWPC is the world’s largest display and computer power supply manufacturer and the third largest LCD TV manufacturer. The first computer developer and manufacturer in China, GWPC is publicly traded on the Shenzhen Stock Exchange since 1996. It is currently ranked 395 in the 2013 Fortune 500. GWPC acquired Satcon in 2013 and has delivered over 100 MW of Satcon systems since that time. SIC USA, a subsidiary of Skwentex Internations Corporation (SIC) manages service and sales for Satcon across North America, Taiwan and Europe. SIC specializes in the sales and distribution of Printed Circuit Boards, Functional and Industrial Materials, Automotive and Semi-Conductor Electronics, LED, LCD Optical and Semi-Conductor Equipment, and Solar Equipment. Satcon is the proven world leader in high power, large-scale solar inverter technology solutions. With over 3 GW of solutions sold worldwide since 2006, Satcon consistently delivers best in class levels of quality, performance and reliability while enabling the highest degree of system design flexibility.